Jo Jones, who came to be known as “Papa Jo,” was one of the most important and influential drummers of all time. After growing up in Alabama, Jones worked as a drummer and tap-dancer with carnival shows and later with bands, including Walter Page's Blue Devils in Oklahoma City and Lloyd Hunter's band in Nebraska. His big break came in 1936 when he joined Count Basie's band in Kansas City where he developed his innovative style using brushes on drums and shifting the role of timekeeping from the bass drum to the hi-hat symbol. He went with Basie to New York in 1936 and with Freddie Green and Walter Page formed its rhythm sections. Except for the period 1944-46 when he served in the U.S. Army, Jones was with the Basie band until 1948. During the 1950s he participated in the Jazz at the Philharmonic concert series and appeared at the Newport Jazz Festival with Basie. He continued to perform during the 1960s and 1970s with solo drum sessions and reunions with the Basie’s band. In 1979, Jones was inducted into the Alabama Jazz Hall of Fame and was the 1985 recipient of an American Jazz Masters fellowship awarded by the National Endowment for the Arts. But you probably knew most of that. In Rifftide Papa Jo tells us a lot more, although he never got around to writing his autobiography. Rather, he said to his friend, writer Albert Murray, “This is my last hoo-rah. I will not give this wealth of information to nobody else because they don’t know how to handle it.” While Murray had planned at some time to write a book on Jones, he ultimately loaned the tapes they recorded together to Paul Devlin, a writer and protégé who edited them into the narrative of Rifftide. The work is completed with an afterword by Phil Schaff, a jazz historian who had a long-time personal relationship with Jones. What emerges from this fortunate collaboration is Papa Jo’s take on life with anecdotes from his travels and sojourns over a period of fifty-six years. Besides being what would be called today a musical prodigy, Jones had other gifts; namely a very sharp mind, which was an essential survival skill for an African American determined to make it on his own terms. Jones was a jazz pioneer, but he was also a sage, moral philosopher, sociologist, and historian, able to discern truth and meaning from observation (“I’ve been out there. I’ve been in many things.”), people he encountered (“I know more about these guys than they know about themselves.”), and ex libris (“My thirst for knowledge will never cease.”). The written record of events and individuals often misses what goes on under the radar, where the action is, or as Papa Jo would have put it, “the real story.” In Rifftide, Murray, Devlin and Schaap have taken Papa Jo’s digressions on music, show business, and people beyond biography or cultural history and have produced a reflection on the American experience in the tradition of Alexis de Tocqueville. 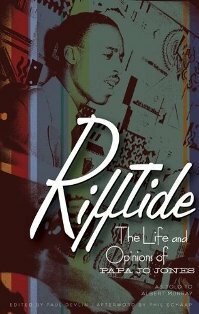 Rifftide is a work of exceptional merit. Jim Buford’s latest book is The House Across the Road and Other Stories.